A while ago, I blogged a yeasted amaranth pizza crust recipe (superseded since then by this much quicker version), but I don’t always want to wait for yeasted doughs to rise. The amaranth dough took especially long to rise. This recipe is pretty similar to the original, but it’s a quick bread, and rises higher to give a thicker based pizza. I considered just amending the original blog (have you noticed that I tend to tweak them? ), but there are sufficient differences that it would get confusing, so here’s the new one. From start to finish, it’s done in 45 minutes. Note that I used tapioca starch here, which gives a softer texture than corn starch. However, the pizza is still sturdy enough to take the toppings before going into the oven. The kids and I wolfed this one down this evening. Put the dry ingredients into a food processor. Put the eggs in a measuring jug, and fill with non-dairy milk to the 12 fl oz mark. Add the other (non-topping) ingredients to the food processor and process, adding the liquid ingredients over a ~10 second period, and continue processing for about 30 seconds. The dough will be soft, but cohesive, and look slightly stickier than wheat dough at this point, and not so smooth. Now, quickly turn the dough onto a parchment lined cookie tray or perforated pizza pan, and lightly spread it out in an even layer with hands (or a rolling pin on top of another layer of oiled parchment paper) to more or less cover the tray/pan, or on a pizza paddle to the size of your pizza stone. You don’t want to compress it much, as the baking soda will already have done some of its job. Cook in the middle of the oven for 25 minutes at 375F. 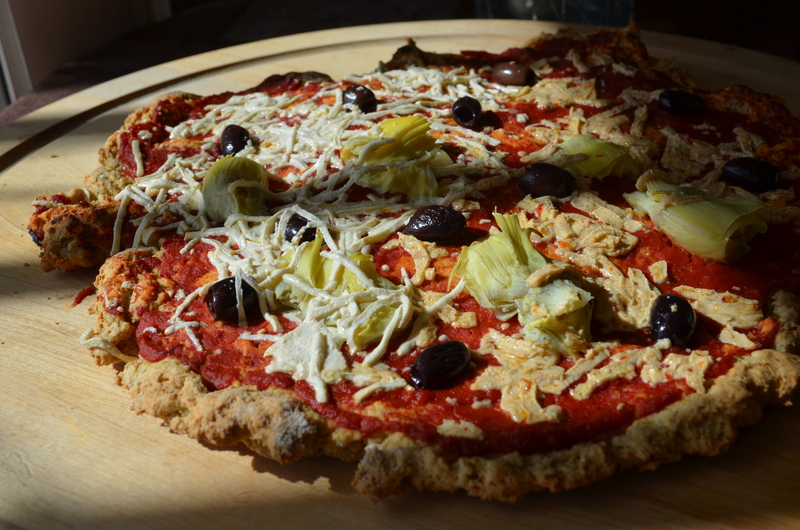 This entry was posted in I.2 Pizza and tagged dairy free, gluten-free, pizza crust, vegetarian, wheat free.